A shoe that can do a lot! 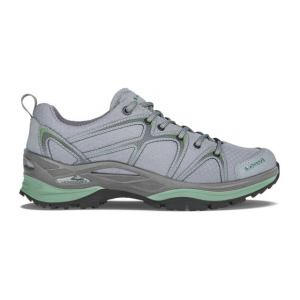 Just as able to be a light hiker as it is a trail runner, this lightweight shoe is as versatile as it is comfortable. 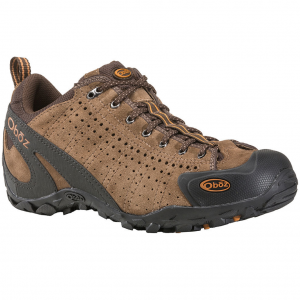 With great ventilation due to the single-piece mesh upper, excellent traction, and exceptional heel cup, this shoe is the one I lace up for a multitude of warm-weather outdoor activities. I’ve hiked with the Oboz Sundogs since early April (nearly three months at the time of review). Many, but not all of the hikes have been in wet conditions, as it has been a very rainy last couple months. 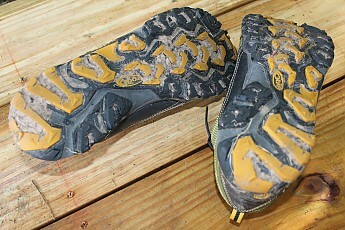 So far, these trail shoes have seen approximately 75-90 miles. They’ve been on various trails in New York’s Southern Tier (mostly in and around Chautauqua Lake, N.Y.) sections of the AT in southern Pennsylvania near Michaux State Forest, and some of my friendly hometown trails. 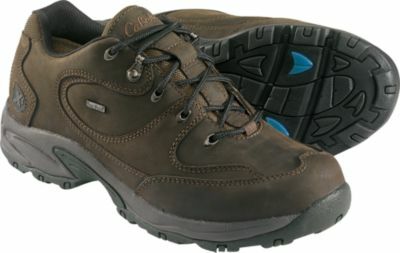 If given the opportunity for continued testing, these will be the shoes I take hiking in the Pacific Northwest later this summer. 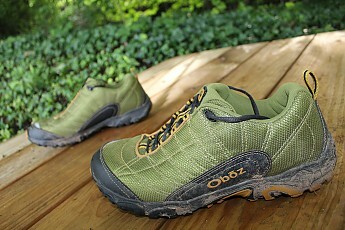 I’ve also used these while mountain biking, trail running, during pick-up games of soccer, and even gardening. Because everyone’s feet are different, it may be helpful for you to know my foot structure. My feet are, on the whole, narrow, but with a slightly wider forefoot, and normal to slightly high arches. Men’s size US 13. The size 13 shoe that I tested runs ever-so-slightly snug (but not small enough to warrant a different size), which equates to wearing light-to-mid hiker socks and avoiding thick wool socks with these shoes. This was only an issue for me because half-sizes don’t exist for 13 and up (I wear size 13 and this is industry standard), and a 14 would have been too big. 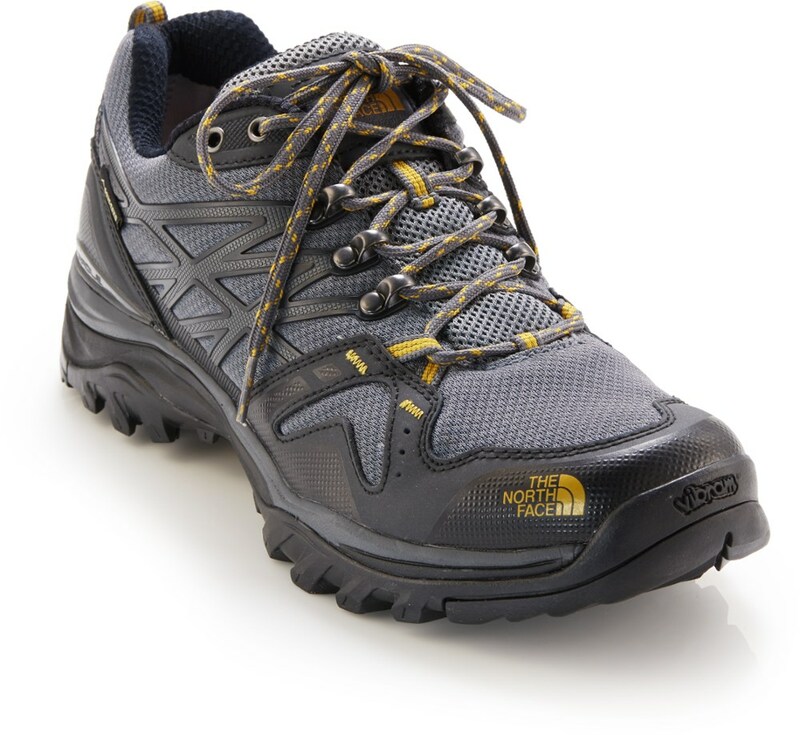 For those of you with “normal” size feet, consider a half size larger than your normal size (which many folks do anyways with their hiking shoes for the added room in the toe). The fit around the ankle cuff is especially nice, as I’ve found over the past several years, many companies skimp on this area with their trail shoes. Not only does the ankle fit securely, it also has adequate protection (for a trail shoe that is), more in line with a trail runner. The toebox is ideal for me. It has adequate room, but wouldn’t be considered overly roomy. 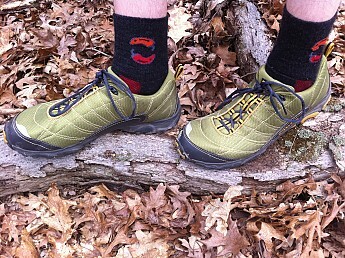 The heel cup is especially comfortable, secure and in my book, probably the best of any trail shoe I’ve ever wore. 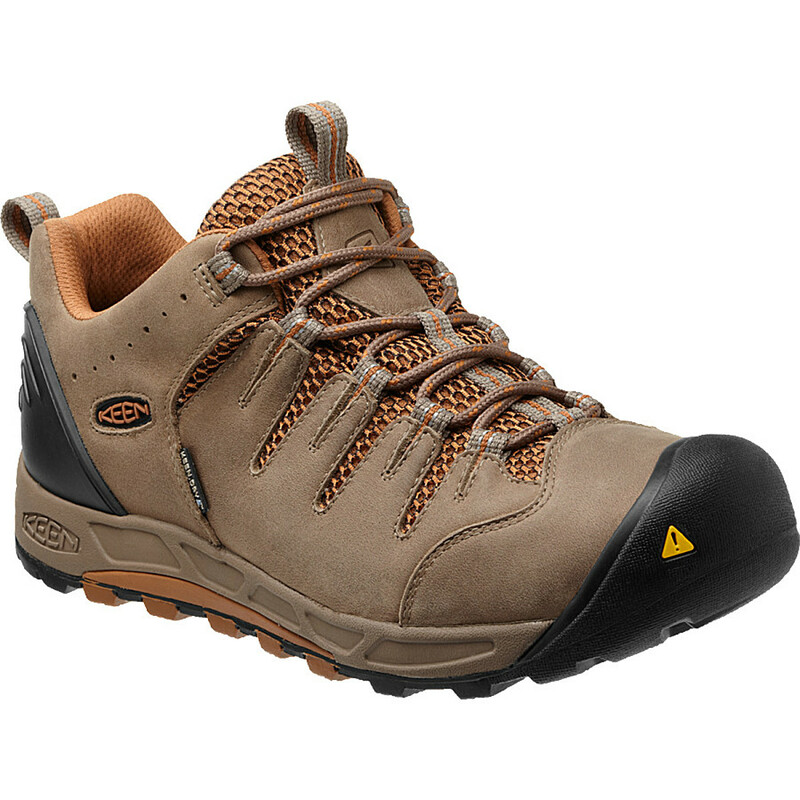 It took my feet a little getting used to this shoe, but I suspect that is because my feet have become accustomed to my existing pair of trail shoes, the Asolo Sunsets, which are very different (different material, different lacing, different ventilation, different soles, etc.). Also, during the time of my testing, there has been a change in my employment causing me to make the transition to wearing dress shoes on a daily basis, which has been somewhat of a shock for my feet. While I’ve thrown a lot at my feet lately, once my feet got used to these shoes­—it was probably after ~5 miles of use—these Oboz Sundog shoes have been consistently comfortable. 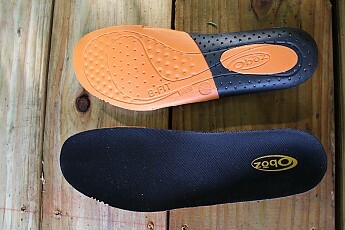 Oboz BFit Essential insole: black area is more hardened plastic, while orange area is comfort foam. 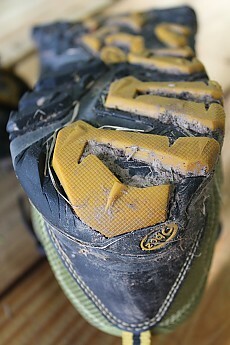 With lots of rain lately, these shoes have experienced some very wet and muddy trails. The traction has not been compromised. While the photos below show some caking of mud in the lugs, this is only after hiking in unavoidable very muddy conditions. Most trails I encountered have been rocky and root-laden trails, including some scrambling. The grip on each of these surfaces, whether dry or wet, has met my expectations. While encountering sharp, pointed rocks, this shoe tends to lean toward a stiff walking shoe, where the rock isn't felt nearly as badly as it would in say, a running shoe. The midsole is a dual-density EVA, which it feels the same today as it did out of the box. Combined with their own sole (Hyalite), I’ve continuously felt sure footed, even when hiking through some very wet and slick conditions. One reason for that sure-footedness is the shoe's lateral support, which seems to be as good or better than most trail shoes I've worn. 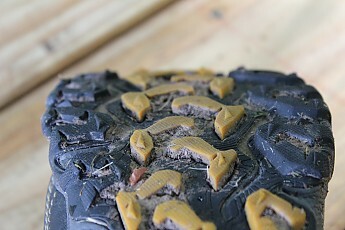 As an example of how well these soles perform, while hiking with a friend on a rainy day, he slipped three or four times (one of the slips he ended up covered in mud) wearing another major trail shoe manufacturer’s shoes (his trail shoes were just as new as mine, so it was not a matter of having worn out soles). This is the day after a muddy hike. Minimal caking in the lugs for me, but you should have seen my friend's shoes. His other brand shoes were a mess! Being my first fully mesh trail shoes in a while, I forgot how well this material can vent in warm conditions. 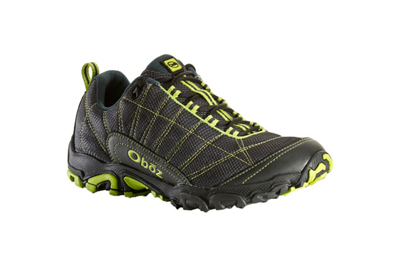 Oboz’s use of a single-piece mesh upper does two things for this shoe 1) it allows the shoe to vent extraordinarily well, and 2) it seems to give the shoe more flexibility. Not to mention, the single-piece mesh is comfortable and it probably allows them to shave some weight and waste in production. The color is called Woodbine, which I must admit, is growing on me. Out of the box, I wasn’t a fan of the color as it is too bold for my tastes. However, on the trail and in the wilderness, the color seems at home. The first thing I noticed about the shoe was the lacing and it didn’t have me too excited. 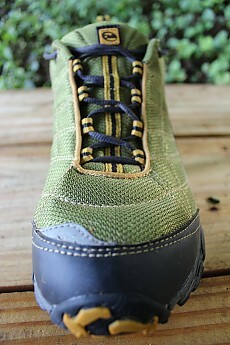 I typically prefer laces that run further down near the toe as I’ve found it to provide stability and comfort. 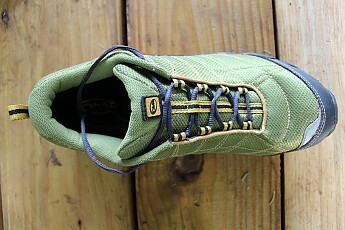 This is the first trail shoe I’ve owned where the lacing contact points are webbing. I’ve read that these tend to wear out quicker over time opposed to hooks or punched eyelets, but I don’t know that from experience. So far, there are no signs of wear to the webbing, but this will be an area I keep a close eye one. When loosening the laces, it seems as though the webbing impairs the loosening of the laces, which slows down the process of taking the shoes off. Another area that I want to closely watch is the synthetic leather toe cap. While I have a great deal of respect for Oboz in creating this shoe to be highly versatile, in doing so, they inevitably had to find places to cut weight and the toe cap MAY be one of them. While I haven’t had any issues yet with toe abrasion, it’s hard not to notice the thinness of the toe cap. Again, no issues yet, but I’m curious as to what another 100 or 200 miles on these may look like. 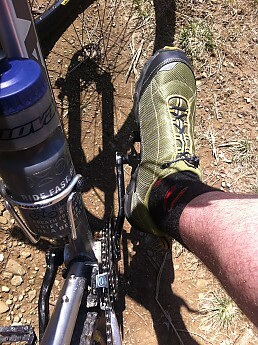 Taking a foot photo while mountain biking is not easy. 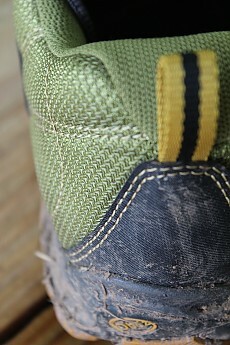 One of the few times I've hiked with these shoes in dry conditions. Conclusion: Do I now prefer all-mesh or all-leather? 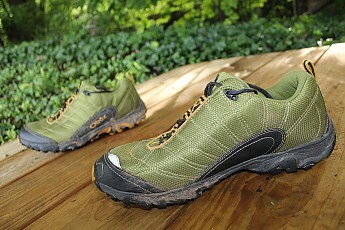 As mentioned in the review, this is my first pair of all-mesh trail shoes in a long time. I have a pair of all-leather boots, and a pair of part-suede leather/part-mesh trail shoes (the Asolo Sunsets that I previously mentioned). 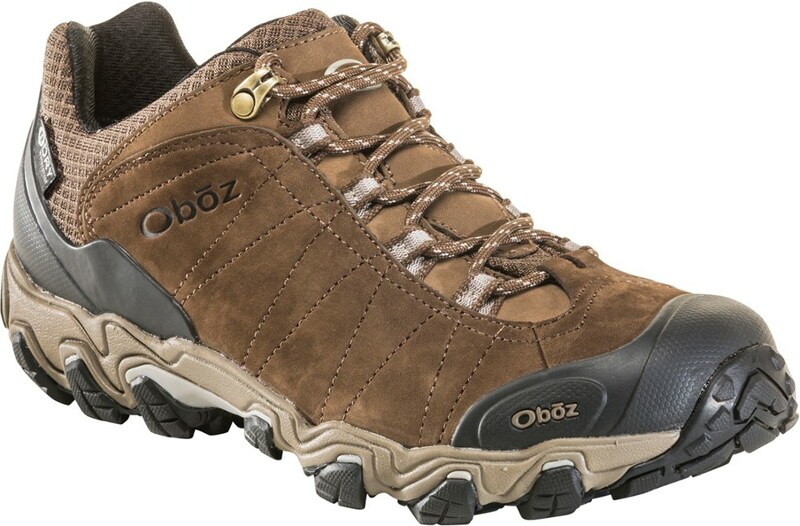 While the full-leather boots have their use, and the Sunsets are more comfortable for my feet, these all-mesh Oboz shoes seem to have the most preferable characteristics (dry the quickest, lightest, and vents the best). 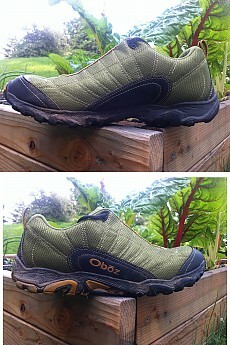 While there are still good reasons to wear other shoes, I suspect these will be my go-to trail shoes on most occasions. Nice review, Kiwi! Thanks for taking the time to test these shoes out and review them. I'm liking the woodbine color, at least in your excellent pictures. 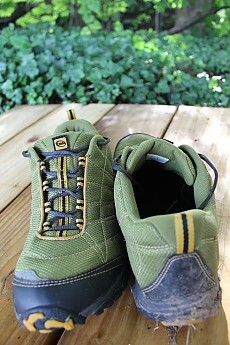 I'll be curious to hear what you think of these shoes longer term after taking them to the Pacific Northwest. I forgot to add that I cringed when you said you now have to wear dress shoes to work. Oh no! Thanks for the helpful review, Kiwi! It is super helpful to know the description of your foot before reading the review. They look really awesome. I've never seen anything like them before, but I really like them! Great info and nice pics. thanks! 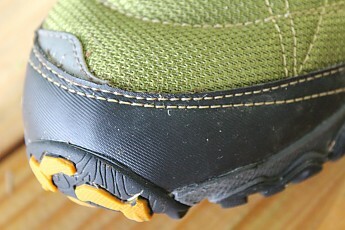 Most hikers require/expect you to purchase a separate insole. Was that the case here, or is the insole good quality? Goose, I am fortunate to have very forgiving feet that can withstand just about any footware. The time it took my feet to get comfortable with this shoe (~5 miles) is among the longest it's ever taken my feet. I've had only one shoe-related blister in my life, and that was because I lost my socks and thought I'd go sockless on a 3-mile rocky downhill hike back to the car park (it's a long story and not my best idea). I've never encountered knee, ankle or back pain from a pair of footware. So all that to say, the insole is adequate for me, but it's difficult to say that would be the case for others. From the photo it looks to be a better insole than some others. Thanks for the review. To G00SE's point, I went poking around my local gear store and looked closely at the various insoles that are in most comparable shoes (I looked at 8-10 different pairs from various manufacturers). I can say with more confidence now that yes, this is a better, more comprehensive insole than most others on the the market.